I haven't told you about my cat yet, have I? About two months ago, I decided I wanted a new cat. I was unhappy and lonely and I remembered how much joy and comfort my first cat Lily brought. 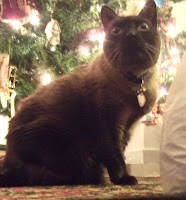 Lily was a beautiful, blue-eyed Siamese mix I took home from the animal shelter the year we moved here. She lived with us for 12 happy years and then one day simply disappeared. I thought she'd come back since she disappeared once before, so I wasn't really worried for the first month or so, then I began to be concerned and started searching for her, but there was no trace. Eventually I just assumed her dead. Cats go off to die sometimes. It's been over a year now and a catless home is...well, sad. ...justifiably, considering how Lily scratched, marked, and peed and could be a general nuisance at times. I had resigned myself to no more pets until I had a home of my own. But in October, I decided I needed a cat, and perhaps because she'd been worried about me, my mother relented. That weekend I went to the shelter. There were several lovely cats there, adorable kittens, talkative tabbies, cats that would reach their paws out through the bars and bat at you playfully. But there was one cat hiding in his cardboard box with his face pressed into the corner. The tag on his cage said he was 2 and a half years old and had been surrendered by his elderly owners because they could no longer afford him. His name was Smokey. I called his name, cajoled him, and finally got him to come out of the box and look at me. Smokey was so shy at first. As soon as I saw his big, soulful, blue eyes, my heart went out to him. He stared at me for a long time with this deep sadness and fear, and I felt like we understood each other. He communicated so much in that gaze - he hated it here, all the frightening noise and other animals and people going in and out, and was wondering why the people who loved him had abandoned him. Could he ever trust anyone again? I had to get him out of this place. It was like, the other cats would be ok, but this cat needed me. Not only that, but he was strikingly beautiful. A rare pale grey-tipped fur with a white undercoat, faint tabby stripes, lynx-like markings on a strong-boned face, and of course those huge round blue eyes like Lily's. After an extended visit in the "family room," where he could hardly be cajoled out of his box, I decided I would take a risk on him. I was afraid he might be one of those timid cats who never comes out of hiding - I didn't want a cat like that, but Smokey was just so traumatized, I took a gamble that he would be come out of his shell when he had a new home. It was the right move. At first Smokey did nothing but hide. It worried me, for the first two days he didn't even come out to eat, drink, or use the litterbox. He found a new hiding place every few hours - between the shower curtains, behind the washing machine, inside the back of the couch. Lily had never been so creative. But after a few days, his personality started to come out. He is a VERY affectionate cat. He loves my mother, and he loves me. He will rub up against us and want to snuggle and leap up to be beside us as soon as we sit down. He has the tiniest little meow, like a kitten, which is funny coming from a 15 pound cat. He also loves to climb and leap all over things Lily never jumped on. My desk, my dresser, the kitchen table, the piano...we have to wave him down off things, but Pamela told me that's a good sign. Pam said that animals tend to be on their very best behavior when they first get into a home, so afraid they're going to be abandoned again. But as they feel more comfortable and safe, they "let down their hair" and start to behave normally. Which, for a cat, a natural tree dweller, usually means getting up as high as possible and prowling around. A cat that crouches, hides and stays low is an unhappy, frightened cat. A cat that leaps over tables and furniture is a confident cat. Now he's been at home for a couple months and I can tell he is perfectly at peace. He lets me know whenever he's the slightest bit hungry, or lonely, or bored, with that tiny mew, still squeaky but no longer shy. He prowls his terrain, high and low, with pride. He goes wild at the sight of the most remotely string-like dangling object, including drawstrings on my pj's, earphones, my knitting of course, and even things like skirts and sleeves. He's completely won over my mother by being adorable and sweet to her. And the funniest part: he rolls over and wants to be scratched on his belly, and he'll lie there rolling back and forth while I ruffle his fluffy white tummy fur. So soft. Smokey has become a real companion and comfort to me. His beauty, his movements, his playfulness, his acceptance and affection have brought so much joy and healing into my life, and I am thankful for that. Well, my pet rambling has probably gone on about as long as you can stand. I should tell you about my Thanksgiving trip to Austin to visit my siblings...maybe another time. Oh, my best friend is in India now with her fiancee. Who knows if she'll ever be back. It's surreal, like a fairytale...like Cinderella. She's been wanting to go, dreaming about it for so long, now she's actually there. She had no money, no career prospects, little earthly possessions, just love, and a whole lot of faith. Now her love has given her a whole new life. You can read about it in her words if you're interested. I'm planning to be there for their wedding...sometime in 2013. A trip to India...that's something to look forward to.